Hey guys, glad everyone enjoyed my healthy spin on the classic Egyptian breakfast recipe for Ful Mudammas yesterday – if you haven’t already check it out here. I plan on sharing more Arab vegan recipes as the MoFo continues, but for today’s post I wanted to share some insight on a topic that’s very important to me: what it’s like actually being an Arab vegan. No doubt, being a veg*n (vegan or vegetarian) in any society that relies heavily on meat and dairy products can be difficult, for the obvious reasons, but being an Arab vegan in the Middle East – let’s just say Kermit the Frog’s “It’s not easy being green” takes on a whole new meaning. In a nutshell, no – it’s not easy. Having been on a largely plant based diet since the age of 12, I can say that with a fair amount of confidence. But in truth, what I eat is hardly the problem. As you’ll know if you’ve been reading my blog recently – Middle Eastern cuisine is rich in vegetarian dishes which, along with a slew of other omni dishes, can be easily veganised. In fact, some of the best vegan food (in my hummus-biased opinion at least) is of Middle Eastern origin. So trust me, I ain’t starving. For me, the hardships of eating the way I do are a result of the cultural resistance to plant-based diets. Aside from the fact that thriving on a diet consisting solely of vegetables is foreign to most people in the Arab world – many genuinely have a hard time understanding why one would ever subject themselves to such deprivation (“What do you MEAN red meat is not good for you?”). Traditionally, there’s also long standing link between meat and affluence, and in turn an association between fuller figures and affluence. When I was in Egypt this summer, the topic of the ongoing weight loss craze came up at the dinner table. My mom pointed out that in the 50s and 60s, shapely women were more desirable because if you were packing on a few extra pounds that was a sign you were from a wealthy home – basically that you were well fed. Clearly, this is not the case anymore, in the Arab world or otherwise. If anything, in some parts of the world obesity has now become a common indicator of poverty. The point is, this cultural mentality makes it hard for people to understand why I would choose to eschew meat when it’s so readily available to me. 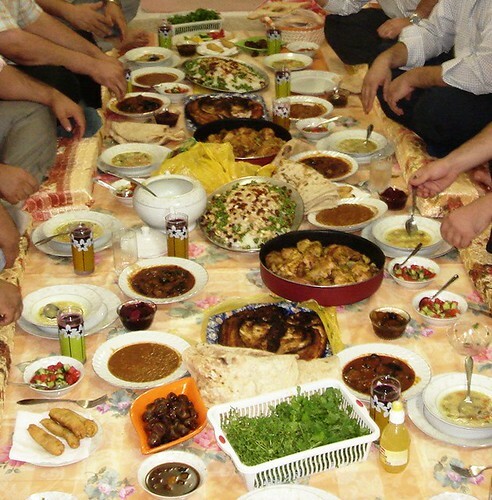 Aside from a nourishment point of view, Arab culture places a large importance on food . There’s an emotional attachment to mealtimes – the dinner table isn’t just where we eat; it’s where we praise each other’s triumphs and offer words of support, where we share family news, good and bad. It’s where we meet after a long day of fasting during Ramadan to break our fast together in observance of the holy month, where we celebrate special occasions like Eid al-Fitr. And sometimes, it’s the one place where we can all just be together, even if only for a few minutes in silence. So what happens when you sit down at the dinner table and barely touch the Fattah (meat and rice stew), or pass on the Molokheya (a chicken broth based soup)? Luckily for me, my immediate family has always been supportive of my diet choices so long as I was healthy. But at larger gatherings, members of my extended family are often confused and sometimes hurt that I won’t try what they’ve cooked. It’s almost an insult to them if I don’t indulge in the meal that they so carefully planned and spent hours slaving away at. Furthermore, it can seem like I’m choosing to isolate myself from this meal that they’re all sharing together, especially if options are scarce and I spend half an hour picking at the salad. I’m not going to lie, family gatherings have been a source of stress for me in the past – and even more so now that I’m a vegan as opposed to veggie. But I’ve learned that the best thing you can do is to be up front about it, and try to keep people as informed as possible about your dietary requirements prior to a big meal or gathering. If you make no apologies for the way you eat and are strong in your convictions, people won’t question it. It’s as simple as that. However, if you adopt a sheepish and apologetic tone when telling your great aunt that you can’t really exactly eat her delicious smelling kofta because you’re a vegetarian, she’s less likely to believe you’re serious and will probably spend the rest of the meal piling your plate with meat. Be prepared. Even if it means asking whoever’s cooking to make a meatless version of the main dish or bringing your own salad and veggie pasta – do it. I’ve found my family is a lot more at ease when my plate is full of food – even if it is vegan. That way you’re still part of the wonderful experience that is dining together and you don’t stick out like a sore thumb. I also try to educate people as much as I can – but only when it’s appropriate. If a family member of friend is intrigued and wants to know more about what I eat and why, I’ll go for it. I tell them why being healthy is important to me and that my body feels best when I achieve that through wholesome, nourishing plant-based nutrition and regular exercise. If they don’t really seem bothered and just ask a couple of questions, I answer politely and chow down on my food in silence. It’s all about gauging the situation and knowing your audience. I’ve never been one to shove my beliefs down anyone’s throat. I merely want to educate and share my experiences with those who are be interested, which is the essentially the purpose of this blog. Perhaps one of the most important lessons I’ve learned through my experience is not to take myself to seriously, and to have a tough skin. People love to ridicule and mock the unfamiliar – it’s only human. Veg*n diets aren’t the usual fare where I’m from, nor is an overwhelming desire to be healthy. I’ve learned to expect the odd joke and critical comment here and there, but I don’t let it get me down. I’ll join in the fun and laugh it off, or just shrug and act indifferent – but I don’t get defensive. There’s absolutely no need for you to explain or justify yourself to anyone when it comes to diet choices- whether you’re after improved health or are fueled by activism – what you put in your body is your choice. And as long as you’re not harming yourself, no one should ever have the power to make you feel weird about that. I can’t stress this enough. I know so many people who are too intimidated to introduce healthier changes into their lifestyle because they think it’ll make them “weird”. Again, make no excuses for the way you choose to live. You wouldn’t apologise for dressing a certain way or having a certain sense of humour would you? Your diet, health and fitness should be no different. Sure, you might end up with the odd green mustache every once in a while, but who cares? Not me. And not you either.